Well shoot, let's get a background story to this thread. Rosie has a long pedigree, here is her history. Rosie was born in late 2012 here at RTPS. She was the first pull out of a mold that of the saya shell designed by Wyu Ri. 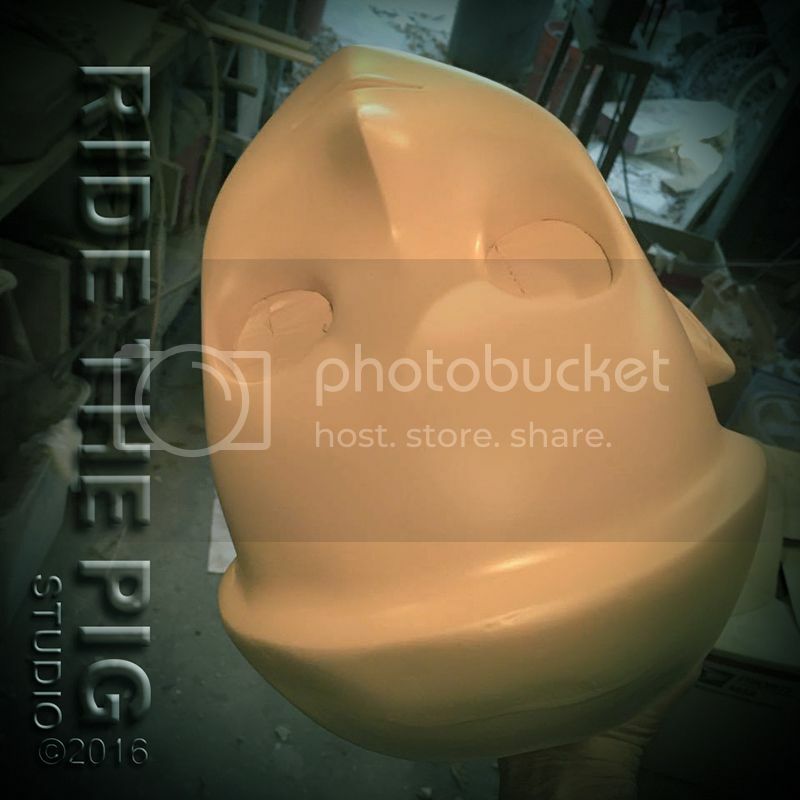 The mold itself was produced in conjunction with Wyu Ri of LiveWearYu Studios and Me of Ride the Pig Studio. The purpose was to produce saya shells to finish and ship the the LiveWearYu studio for final finishing. Her first incarnation was Eve, the first finished saya here at the studio. 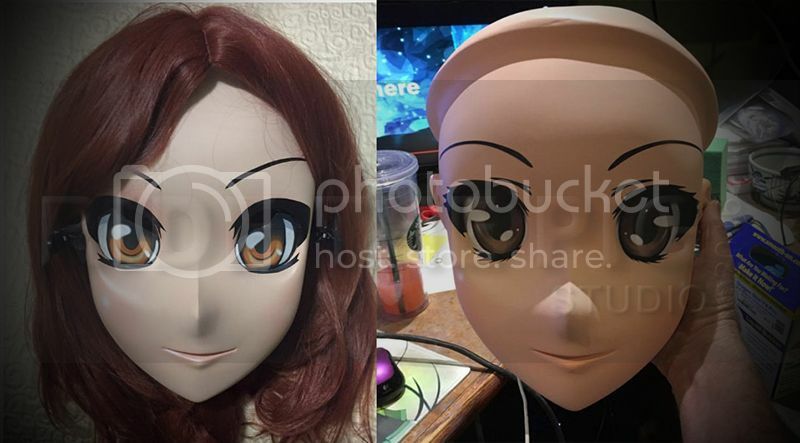 She was an experiment in seeing if my skills were good enough to finish a complete kigurumi mask from an unfinished shell. She quickly reincarnated into Misa Amane but the character was short lived and due to her weight I shelved her. For her third incarnation I converted her for a blond to a red head copying the look and feel of my third kigurumi mask, that being Esther Blanchett. 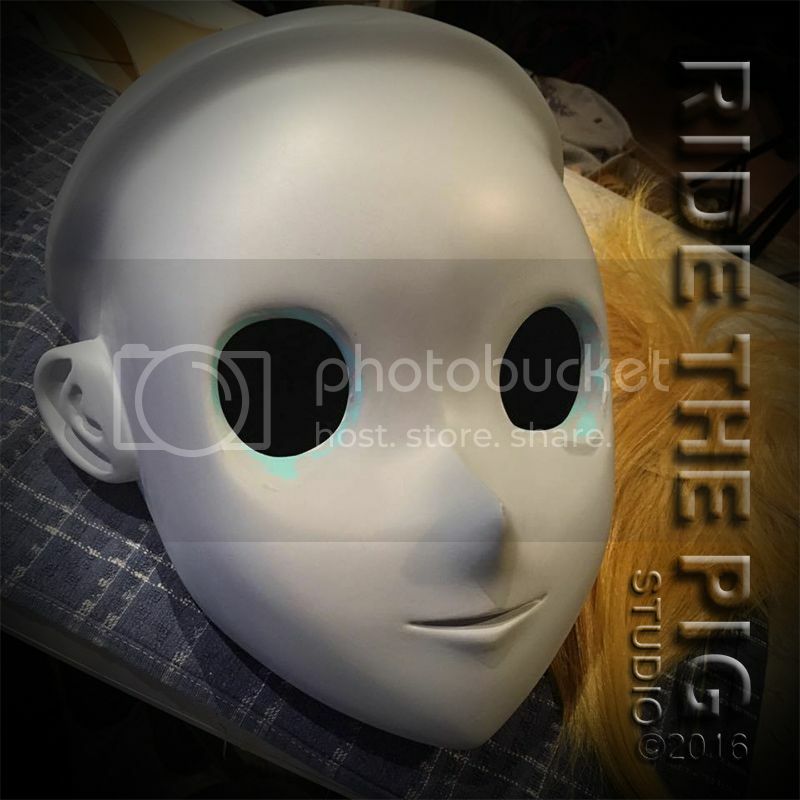 Reason for this conversion was to create a "loaner kigurumi" for clients in need who's masks were her at the studio for repairs or restorations. She was shipped off to Parker Kig and remained there as a loaner for 9 months. Of course for reasons that still baffle myself, Parker's "Lilly" had been returned seven months prior to Esther's return here to the studio. The loaner kigurumi idea was shelved along with Esther upon her return. In comes a new player. Sofa, new to kigurumi and a local here to the studio. I knew the need for Esther's services were once again needed. She was resurfaced, fully restored and eyed and haired to the delight of sofa. Rosie, her 4th incarnation. her service to sofa as a new kigurumi lasted for a little over a year. After the acquisition of a new mask, sofa shelved Rosie. It was not until sofa's sale of rosie to her current partant, did she resurface. 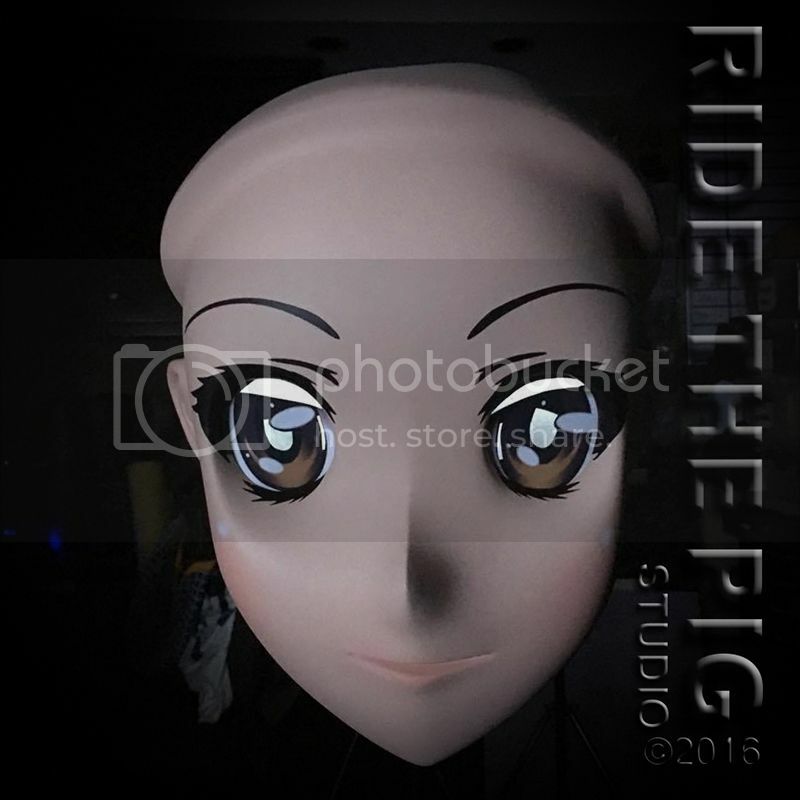 The new owner, RosieKig, pressed rosie back into service where she has been seen at conventions like Sacanime and Anime Expo. Which brings us to the present. While having one of those moments of, "I really need to get out to a convention and perform" I grabbed JesseKig and the two of us drove two and a half hours to Sacanime Summer 2016 for the main day. 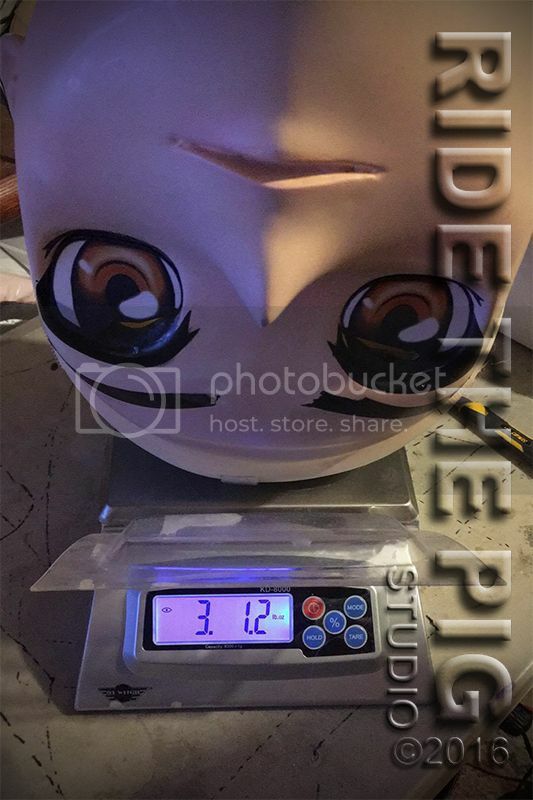 I had contacted RosieKig and the owners of NikoNiko, letting them know I was coming into town for a short but sweet 6 hours of con time. They were so nice to offer me a place the change out, however the walk to their hotel was a bit more than I wanted, so I contacted friends I knew were staying at the Hotel across from the SCC making arrangements to have a changing area their with them. Moving the eyes to the interior of the mask would cleanup what had always bothered me about the design. 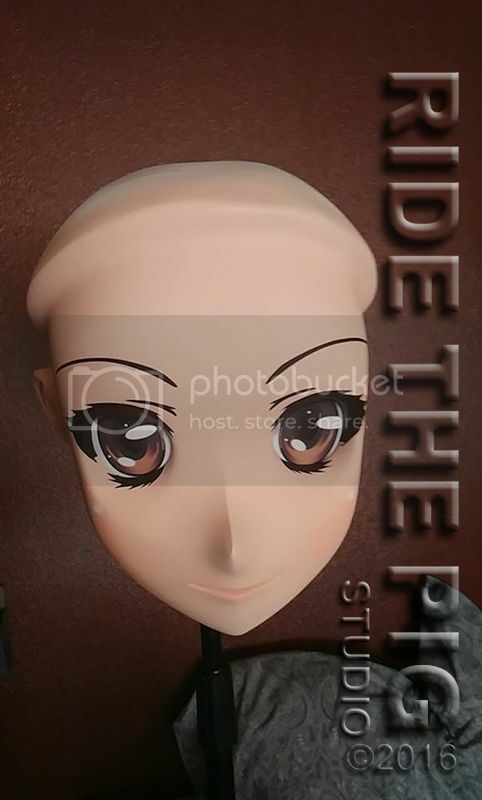 You have to realize the front mount eyes on a saya are velcroed to the front of the mask, leaving a huge gap around the eyes. The compensate for the gap and the reveal around the eye sockets, black paint was used to camouflage the gap. Having rear mounts eliminates this look totally, giving the mask a more finished look. Removing the back of the eye sockets eliminates another one of my complaints with this design, that being "no down or side to side vision"
Rosie is a porker, being the first pull out of the mold I wasn't concerned with weight. Coming in at 3 pounds, 12 ounces, she's a freaking boat anchor. Removing excess material from the interior after removing the backs of the eye sockets was paramount on my to-do list. 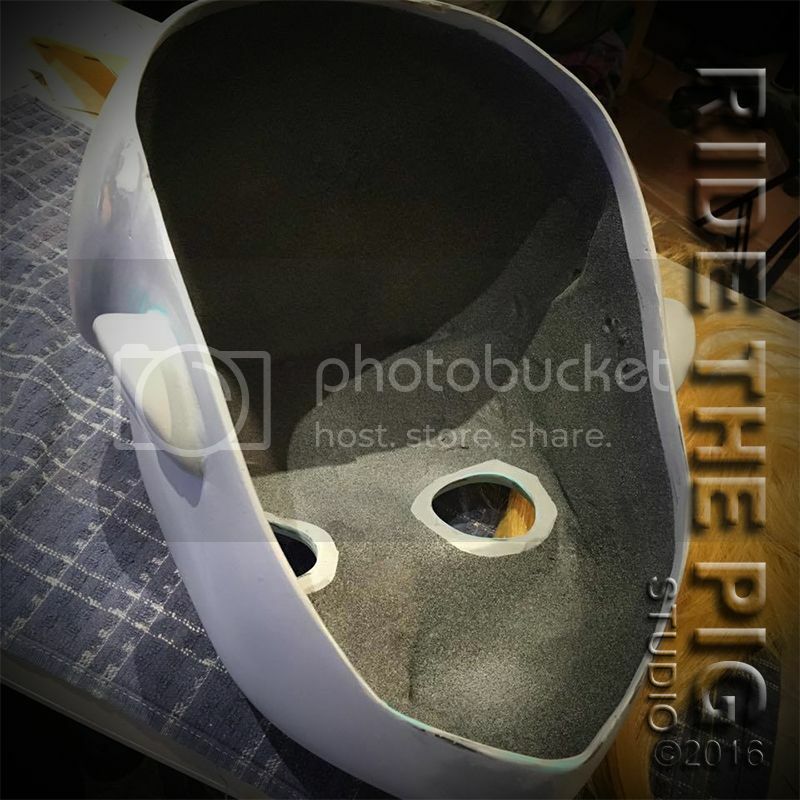 Here you can see the original eye ports and the polyester resin ears. Once removed, the ears were replaced with lightweight cast urethane. Also you can see just how bad the finish had become. I was really disappoint to see her in this condition and felt the need to make her shine once again. Oh my God, notice something missing?? 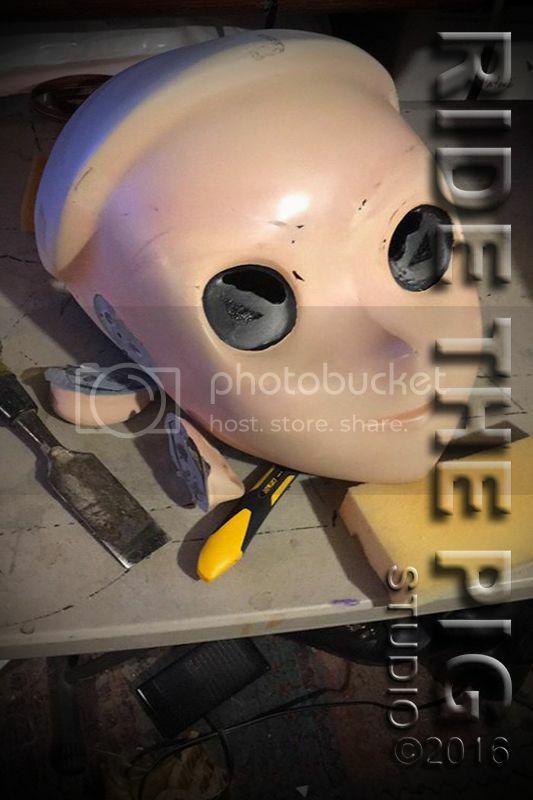 Yes the rear of the eye sockets have been removed along with about 4 coats of paint and at least 9 ounces of laminat from the inside of the mask. 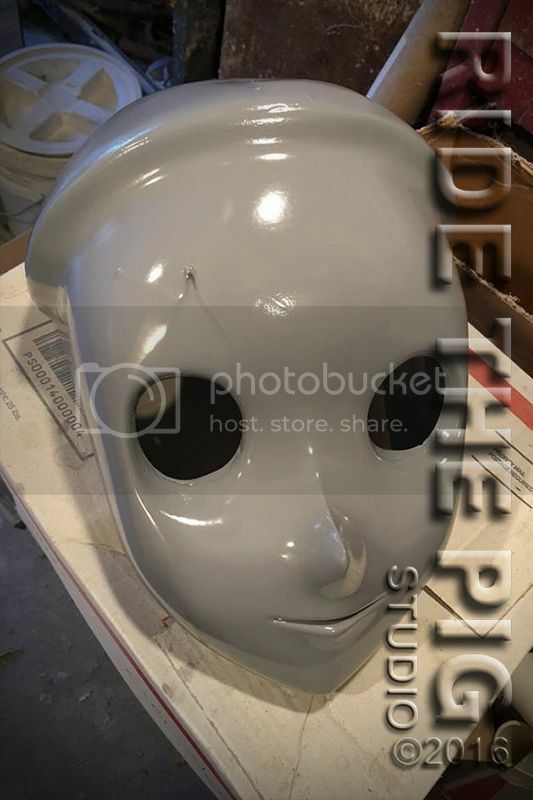 After removing all the paint and the old style liner from the edge of the mask she was coated with light gray epoxy sealer. This does a few things. As a sealer it inhibits any type of contaminant from the substrate contaminating the products used for resurfacing. No crazing, cracking or blisters. After the sealer cured the mask was "dry" sanded with 320 grit and spot filled to remove small flaws and pinholes still present in it's surface. It was also primed "twice" with a two automotive buildup primer. The edges of the mask were built up and given a soft curve eliminating the need for any type of liner. The rear of the eye sockets ground flat to receive the new eyes. Once done the interior was coated with an automotive finish. 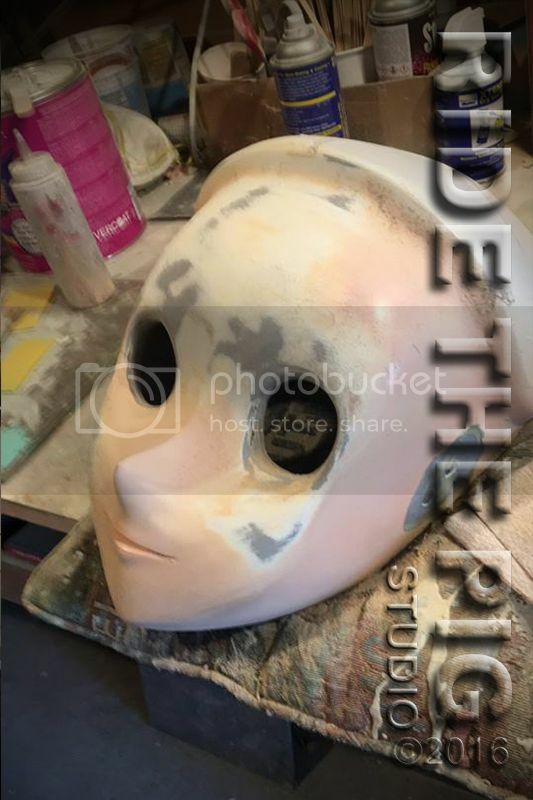 Once I was satisfied with the prep job the mask was coated with the first of 2 coats of an organic based automotive finish that has been formulated to match the hadatai color sold be the studio. Now that the finish and makeup was allowed to cure the graphics and new eyes were installed. After doing so the new ports are revealed. Notice the pricacy screens to obscure the user's eyes from being seen while wearing. After a two and a half turn around Rosie 2.0 arrives safely back at home with her parent. A piece of art... undoubtedly ! The old girl has never looked better.